Enjoy delicious homemade ice cream when you want with the ICMP400BLUE Nostalgia Electrics 4-Quart Blue Bucket Electric Ice Cream Maker. Place the aluminum canister filled with ingredients in the center of the bucket and layer it with ice and salt. Stand back and watch as the electric motor does the churning for you. Soon, delicious ice cream is ready to serve your family and friends. It is designed to produce up to 4 quarts per batch. The Nostalgia Electrics ice cream maker comes with a blue plastic buck and dasher. It also has an aluminum canister for long-lasting durability. An instruction manual is included for simple use and it includes recipes to help get you started. The 4-quart electric ice cream maker also comes with a clear lid on the canister for easy viewing. Treat all ages to homemade goodness with this fun and convenient machine. See all kitchen appliances on Walmart.com. Save money. Live better. The first time I used it I wasn't prepared and used the salt I had in the house. This time I picked up some "ice cream salt" at my local grocery store. It's just rock salt. It made such a difference. The ice cream came out amazing. The inconvenience of having to have special salt is nothing. I make my own ice cream because I want to make something that I know the ingredients, I make it low carb with stevia. The kids love it. After reading a few reviews I decided to buy this ice cream maker and am glad I did, becuase it works great. I'd like to address some of the issues the other reviews had. 1) Ice cream comes out like soft serve. I'm. Not sure if people don't read instructions, but it very clearly states that the ice cream will come out that way and will need to be in the freezer for 4 hours afterwards. Even my ice cream cookbook (which is not associated with the ice cream maker) states that all of the recipes need to frozen for at least 4 hours. 2) The ice cream maker is loud. It's a metal cylinder scraping against ice, so it's going to make noise. Overall, if you read the instructions and use common sense, you shouldn't have any problems with it. Ice cream recipes great too! I purchased this electric ice cream maker to make my own ice cream with real ingredients. I am very happy with my choice of this compact maker. I've had a manual one in the past and found the hand churning a chore after a while. 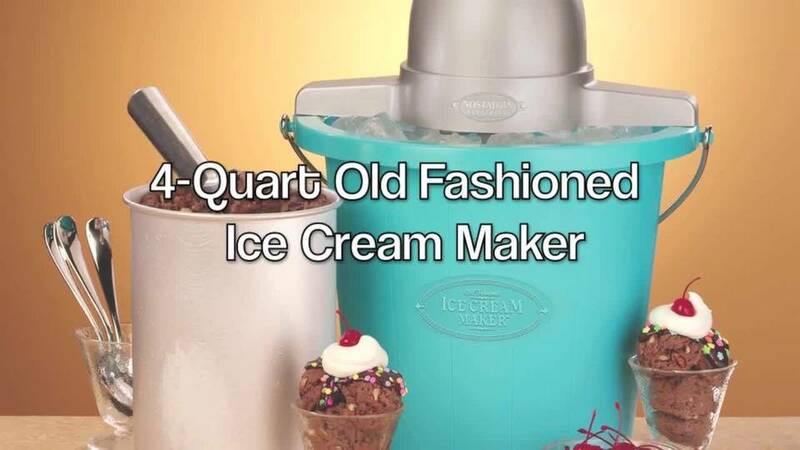 The Nostalgia Ice Cream Maker works very well, just as described, by following the directions as given and using the recipes included as your starting point. The ice cream comes out creamy, has a thick consistency right out of the machine and tastes like the best store-bought minus the gum, fillers and E stuff. I do slightly cook the egg base before churning as suggested in the recipe booklet. I find the directions true and the machine auto stops when done after about 30 minutes. The noise is like that of any mixer. The ice and salt layering is easy to do. I usually add some of both once during the process. Since it makes a gallon of ice cream and I like to vary flavors, I divide up the soft ice cream into 4 parts after churning to add flavors and mix it up, one with peppermint candies, one chocolate chip, one pecan etc. To get really hard ice cream, it goes in the freezer for about an hour. It keeps easily a week or more, if not eaten up before then. I've used this twice since getting it 3 weeks ago. I used one of the recipes included for the peanut butter ice cream. It was great. I've had an issue with it not stopping after around 30 minutes like they say, but I'm always right there, so I stop it myself. I thought the issue might be that I didn't use enough ice or salt, so I used more the second time. The ice cream did thicken more that time, but the machine didn't stop itself. To me that's not a huge deal because I make sure I'm right there in case of ice jamming, etc. My kids love the homemade ice cream. Does it save money? Maybe because you are making a gallon. One thing for sure is that you know exactly what's going in it and you always have the option to find other recipes if you want to make it healthier. I was hesitate to order this machine because all the other plastic makers I have had or looked at were pieces of junk. This ice cream maker is very hard plastic like the old ones, freezes quickly, and is a lot quieter than others I have had in the past. We bought this ice cream maker to make sugar-free ice cream. We have only used it once so far, but the machine worked fine making the ice cream. We had tried the kind of makers that use a frozen bowl instead of ice, but that one didn't work very well. The bowl didn't stay cold enough to freeze the mix. So, we went back to a regular style of machine with ice. The results were just what we were expecting too. We had also looked at the makers with the wooden buckets. Those were more expensive though for the same size machine. 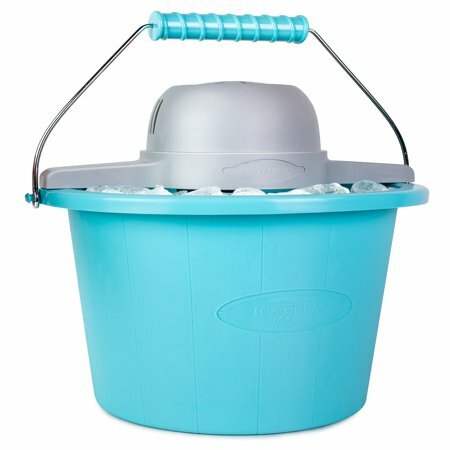 We like the plastic bucket with this one because cleanup was very easy - just rinse the bucket out. Another nice feature of this machine is the clear top to the canister. It allows the ice cream to be seen while it is mixing so you can have a better idea of when it is done. The only part we wish would be better is how the motor mounts to the bucket. It fits into two slots on the top of the bucket that can be a bit of a challenge to insert. Otherwise, we really like the machine. We thought we were buying a large Ice Cream maker from the size pictured of this item. We were surprised to find out it isn't all that large at all, the outside contain is large because of the amount of ice needed to make this item preform well. 6 to 8 bags of ice for each batch! We would ad there is nothing quick about this process, after reading the instructions we are really disappointed about the time required to make a single batch of ice cream. We will NOT be recommending this product to anyone, & may I ad we will probably not use this product all that often. We were thinking this would be a cheap easy way to make large batch soft style ice cream around the home for family & friends. However we found out it not only is an expensive endeavor it takes a long time to produce a little more then a quart of ice cream. Additionally there weren't even recipe's included in with the instruction pages. I have been making home made ice cream for years. I previously had a Dolly Madison ice cream freezer that I loved. After many years of use, the motor burned out. It would take only about 30 minutes to make a 4 quart freezer of ice cream. This Nostalgia Electrics went for 2 hours and the motor never did stop to let us know the ice cream was done. When we decided to unplug it and take the ice cream out, it was like VERY soft serve. We used the same ice cream recipe and did everything we usually do. We tried making 2 different batches with the same results.